Daily cast scheduling, cast DooD and cast reports! 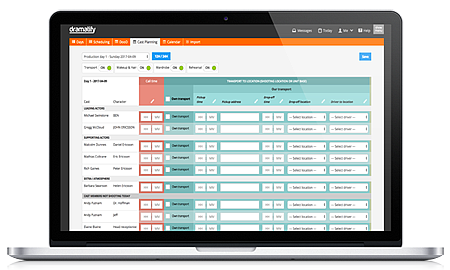 Dramatify have great support for daily cast scheduling and reports, with automatic call sheet integration as well as a Day out of day overview. Dramatify have a comprehensive daily cast scheduling for each production day with call and finish times, transportation details, makeup, F/X makeup, hair, rehearsals and notes. The cast scheduler can schedule both cast that are shooting that day, as well as non-shooting cast that needs to come in for rehearsals or fittings. Each cast member can be scheduled individually, but each scheduling item can also be set for everyone, for instance transport destination, scenes to be rehearsed or call times. That makes cast scheduling a fast task! The cast scheduler feeds directly into the call sheets, and both gives each cast member their personal information as well as transport orders for drivers. Dramatify have a standard Day out of Day report that can also be pulled up in a browser tab along with the production scheduling to optimise cast days. Dramatify have a detailed cast report with all days worked, pages, period, scenes, sets, locations and unit bases. The report can be easily formatted with a few clicks to show exactly what you want. If you want to record cast working hours and meal cost, please learn more at Time Sheets and Food Management. Top image original by Ashley MacKinnon /Flickr (CC BY).